Are you interested in genetic genealogy? That’s genealogy using DNA testing. There is a great free tool you need to make sure you’re using. Before I launch into this post, let me lay the foundation for it. These are the basics many of you may understand, but if you don't, this post won't make sense (or won't be actionable). I am assuming you have taken a DNA test. Alternatively, you might be considering taking one. What's important is, this is a tool you use on your results. This isn't a company to purchase a test from. This tool is for autosomal DNA (atDNA). This is the type of DNA test sold by AncestryDNA, MyHeritage DNA, and 23 and Me. FamilyTreeDNA calls this their "Family Finder" test. There are some additional companies that also offer this type of test. Today, this is the most common type of DNA test taken for genealogy so there's a good chance it's what you have taken. I have two primary goals for writing this post. Make you aware of this free tool and why you should use it. For current users of this tool, give you more ways to encourage your matches to use this tool. So, if you know and use this tool, at least glance through this post and see if it can help you when you are trying to talk matches into uploading their results. I know this is a major hurdle for me, particularly with my AncestryDNA matches. That is part of my purpose of this post. I'm constantly having to provide this information to my matches. Now I have a simple link to provide! GEDmatch is a free website where you upload your atDNA results and are then able to use a bunch of tools to analyze your results. There are two sides to using GEDmatch for an Occasional Genealogist. I want to point this out before you panic and think this is too complicated! There are several advantages to using GEDmatch. Additional tools not provided by your testing company. Ability to compare results (i.e. identify matches) who tested at different companies from you. Allows others to perform their analysis, including your results, without needing you to do anything more. DNA is only helpful when compared against other results. Widening the number of people your results are compared to increases the chance you’ll find useful matches. The additional tools can allow you to do this yourself, but GEDmatch is set-up so all users can perform the same types of analysis without needing more from their matches (i.e. other than your uploaded results and biological lineage information, which you can upload via a GEDCOM). This post isn’t about the tools, specifically. Occasional Genealogists (OGs) often don’t have time to learn more tools, at least initially. This is often the excuse people use for not uploading to GEDmatch, even though it’s free. This post is about the self-serving or altruistic reasons to upload to GEDmatch. The interesting thing is, each reason is essentially the same, it’s only your motive that differs. I am not going to list every tool available through GEDmatch. There are a lot. Since this post is aimed at Occasional Genealogists, the purpose is to give you an idea why you might want to spend your limited time learning to use these tools. Keep in mind I’ve told you there is still benefit to using GEDmatch, even if you don’t learn to use the tools. In a nutshell, atDNA helps us identify DNA cousins (our matches) who share a “segment” of DNA. When we take an atDNA test and get results back, the results are a list of matches. It is up to us to perform an analysis to determine how we are related (if at all) to those matches. The fact they are provided as a match only tells us they share a minimum threshold of DNA with us. The threshold is set by the testing company. Obviously, your matches have a “relationship” listed so they aren’t all the same. This is an ESTIMATE. The estimate is purely statistical. That means it is estimated using the percentage of shared DNA, nothing else. OK, so what does this have to do with the tools at GEDmatch? Remember I used the word “segment” of shared DNA? Just comparing trees doesn’t tell you where your shared DNA comes from. If both compared trees are correct, you are related, but that doesn’t mean that is the relationship where the “segment” of shared DNA is from. Note you can share several segments and they can be from one ancestor or several. I’m just going to phrase this as one segment for simplicity. You can see shared segments at FamilyTreedDNA and 23 and Me. However, even on those sites, the tools are limited. AncestryDNA provides NOTHING to help you with shared segments. There are multiple tools at GEDmatch that help you compare and analyze shared segments. Plus you can compare to people tested at the different companies, increasing the number of matches you have to work with. In the end, what you want, is to identify which ancestor you inherited each of your segments from. Then, when you determine a match shares part of that segment with you, you know who you inherited it from and therefore they had to inherit their segment from the same source (although it might be from an earlier generation). You should automatically be able to tell from my caveat that this is a process and it has to be refined. That’s why you need so many tools. When comparing to a match, you need to know which segment they share with you. You need biological lineage information, eventually. You will also need more than one match that shares that segment. Then it’s a matter of comparing. GEDmatch provides statistical tools to help you pick a starting place. It provides tools for your segments, and different ways to visualize them, so you can start to group your matches by the segments they share with you. They also have the option to upload a GEDCOM so your tree can be available on the site. There are also an assortment of other tools you may or may not be interested in (like “Predict Eye Color”). Once you do want to really get into using the tools, one of my favorite things about GEDmatch is the availability of tools that use your results in tandem with results of your close relatives. Part of the reason this is a favorite is, it doesn’t matter that I’ve had my close relatives tested at three different companies. This allows me to spread each branch across a variety of testing companies (without having to have the same person tested at multiple companies, saving me money). I still can use the tools at GEDmatch to really try and determine which branch DNA cousins belong to. The first draft of this post seemed to harp too much on the negative side of "letting others do it for you." There are some out there, and they seem more prevalent in genetic genealogy than in traditional genealogy, that take an extreme approach. I don't want to harp on a negative so I'm making this quick. Someone is not just going to come along and do your analysis for you and email you and say, "here it is." That is not why I'm telling you to upload to GEDmatch. This is about collaboration. If you want your DNA results analyzed, you need to either do it yourself or pay a professional to do it for you. Analysis is hard. I completely understand if neither option is reasonable for you right now. Most people would not assume someone will just do it for them (whether DNA analysis or traditional research). But I wanted to be clear because I have had some experiences, and heard some tales of other’s experiences, where someone has been rather rude and essentially assumed someone would (and should) do DNA analysis for them---or hold their hand to teach them how to do it. That’s a tall order! Genetic genealogists are some of the most sharing genealogists out there. Don't take advantage of them, but it's OK to use them to your advantage. You have to share to use DNA and it's fine to ask questions. Just realize it's up to you to learn and do your own analysis. Don’t expect someone to do it for you. Sometimes you get lucky and someone does some of the analysis for you. This shouldn’t be THE reason you upload, it might not happen. This is A good reason to upload your results, even if you don't have time to learn the tools right now. Most people are confused and overwhelmed by their DNA results. It takes learning a skill set as broad as general genealogy to successfully do genetic genealogy. It won't happen in a day. Uploading to GEDmatch is a step towards using your results to their fullest. You might be lucky and someone will perform an analysis using your results and share with you. If you don’t upload, there’s no chance this will happen. Hopefully, you'll have more time later (or maybe you will choose to pay someone to do analysis for you). If you uploaded to GEDmatch already, there's a good chance when you (or someone you hire) starts contacting your matches, one or more of them may have done some analysis and can very quickly provide helpful feedback. A match may not contact you if they can get what they need online, especially if they determine you don't fit in with whatever project they are working on. However, that doesn't mean what they determine won't be helpful when you want to embark on your own analysis of your results. If a match did analysis involving your test, there's a good chance he/she can tell you who you do NOT share DNA with. I wouldn't email someone to tell them (out of the blue) our shared DNA does NOT come from a certain ancestor. I'd be emailing my other matches who DO share DNA from that ancestor. If you've ever emailed someone about traditional research and they've come back and explained they had the same thought but proved it was wrong, you know this can be helpful, even though it doesn't tell you who your ancestor is. Think of uploading to GEDmatch as getting the ball rolling on analysis, even if all you do is upload your results and a GEDCOM. There's another way GEDmatch can help you without having to actually use the tools. One of the reasons many genealogists (or non-genealogists) are overwhelmed after getting their results back is from sharing requests. If you find you are getting more emails from DNA matches than you can manage, you can build some good genealogy karma while providing a standard, and helpful, response. Having matches contact you, and becoming overwhelmed, is a very common problem. It's' a problem the other way, too. You may be getting more requests for information than you can manage, others are getting too few responses. I have been on both sides of this situation and most Occasional Genealogists probably will be, at one time or another. It's just a good policy to follow the golden rule. In this case, do what you can to help those requesting information, you might be the requester someday. The way this relates to GEDmatch, is, first, upload your results. Second, upload a GEDCOM or have a link to a public tree you can quickly share. This does not have to be an extensive and fully sourced tree. That would be great, but if all you have time for is the minimum, that is better than nothing. The point here is not to do research for someone, the point is providing information when they ask. That means actually providing the information, not having the intention to, but never following through. When someone asks if you can provide more information, you can share your GEDmatch id (if they didn't find you through GEDmatch). This will allow the person to know which GEDmatch profile matches your test from your testing company. If they haven't already found your tree, provide the link or tell them it is available (as appropriate). This will allow anyone with sufficient skills to do what THEY need to do. It would be great to help everyone but this “canned” response provides enough information. If the match needs more help than this, and you don’t have time (or the skills) to provide more help, you don’t have the time (or skills). That’s reality. I hope I’ve convinced you to upload your atDNA results to GEDmatch. 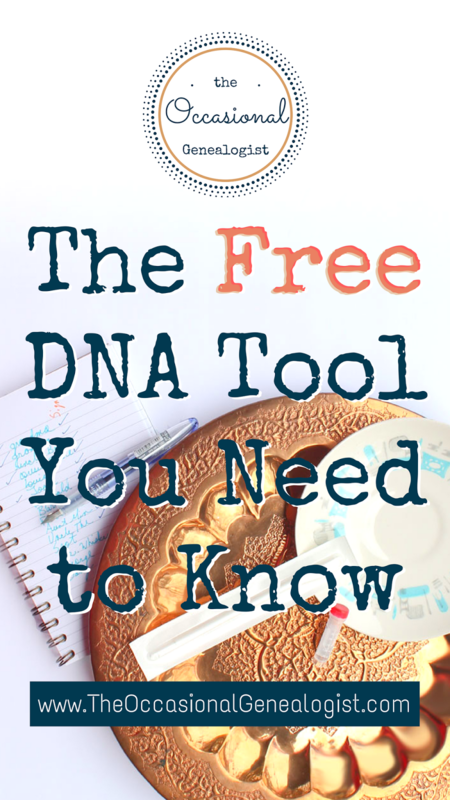 If you want to delve deeper into genetic genealogy, you’ll want the tools provided. If you don’t have time (or even the inclination) to learn the tools right now, you might get some lucky advantages when a match does some analysis that can help you. Hopefully, you’re also interested in building up some good genealogy karma (by following the golden rule). You might just want a canned response that will actually get the matches that keep emailing you to leave you alone, though. If you do want to provide enough information for your matches to work without needing more from you (regardless whether you’re altruistic or just want to be left alone), you do need to provide a minimum amount of lineage information. If you can provide a family tree, great. But what if that’s a problem for you? What is the minimum? This is just like starting any other genealogy project. Provide names, dates, and places (birth, marriage, death) of the most recent generation you are willing to share. That might be your parents or your grandparents. If you are willing to share one or two more generations, that is usually plenty. Personally, if you’re not providing a beautifully cited tree, I don’t really want more. For most of us, it's not a problem if you start with your grandparents. They will appear in the 1940 or earlier census records. If you are quite young and your grandparents don't appear in the 1940 census because they weren't born, yet, try and provide your great-grandparents if at all possible. Depending on the location, research from the mid-20th century can be quite difficult due to privacy laws so you need to try and provide information for people who appear in census records or who you know have multiple online records. If we’re really talking minimums, the dates and places don't even have to be exact. Try to avoid providing information that will lead people astray, though. If you don’t know how to create an online public tree or don’t want to create one, write up a “canned” response. This can be a tree but if that’s not what you want to share, you can narratively write a brief description. You still need to provide those minimum names, dates, and places, though. Keep in mind that having your “name” out there as having tested is like dangling a carrot in front of a donkey. And yes, it’s attached to a string which pulls on you. Your matches are going to try and get the carrot. Providing partial information is the same. Just names are hard to work with. Just dates or just places, with a name, are hard. There’s a lot of chance to make a mistake. People will keep asking for more. The way to cut the string (to give your matches the carrot so they aren’t pulling you anymore) is to provide enough for them to start researching your tree. Tempting them with some information but not enough will keep them coming back. If that’s what you want, fine. If not, give them the whole carrot. It isn’t your responsibility to do research for someone else just as it’s not your responsibility to do the analysis for them. However, it’s rather unsporting to take a DNA test, have the results available publicly, and then refuse to provide any lineage information on yourself (or whoever the testee is). There are options to keep results private so matches do not see them but so you can see matches. If you are totally unwilling to share (not unable, but unwilling) you should use this option. Remember, though, matches care very little about the testee's information. You can keep details about them completely private and still provide some lineage information. If you're just overwhelmed, upload to GEDmatch and create a canned response you can send to anyone (which includes some lineage information). Genetic genealogy is not a quick solution. It is one tool in your genealogy toolbox. Right now, you might not have time to learn to properly use this tool. However, by uploading your results to GEDmatch, you open up the possibility of using the free tools provided (aren't you more likely to try and learn about them once you've already uploaded?). You also open up the chance a match might email you and give you new information since they could include you in their analysis without you having to do anything more. Even if they don't email you, you might contact them later and get information that can save you a lot of time. Whether you want to help others or just want DNA cousins to leave you alone, uploading to GEDmatch can be your answer. Since it’s free, you will get your money’s worth the first day. If you do begin using the tools, you’ll find it invaluable. Finally, if you do find GEDmatch helpful, consider making a one-time donation or a recurring donation. Even $5 helps offset the costs of this amazing free site. You will have access to some advanced tools when you donate, as well. However, I support both GEDmatch and DNAgedcom with recurring donations because their free services are so valuable to the genealogy community. I rarely have a chance to use the advanced tools I have access to. My donation is about the value of these services to all of us. Consider if you have the means to support them, as well. Details are on their respective websites. Thanks. This was very helpful to me. A friend told me about GEDmatch but I was hesitant to use it because I didn't know if it was safe. GEDmatch is safe and legitimate. I couldn't do most of what I do with DNA without them!